EV Grieve: What is your East Village dream home? Kind of a timeless topic to bring up during a slow news week holiday week. Had a conversation recently with an East Village friend... and somehow we started talking about our ideal East Village home. I quickly suggested one with two closets. Sure. Why not. Seems like a nice spot. I've always had my eye on 421 E. Sixth Street between First Avenue and Avenue A. 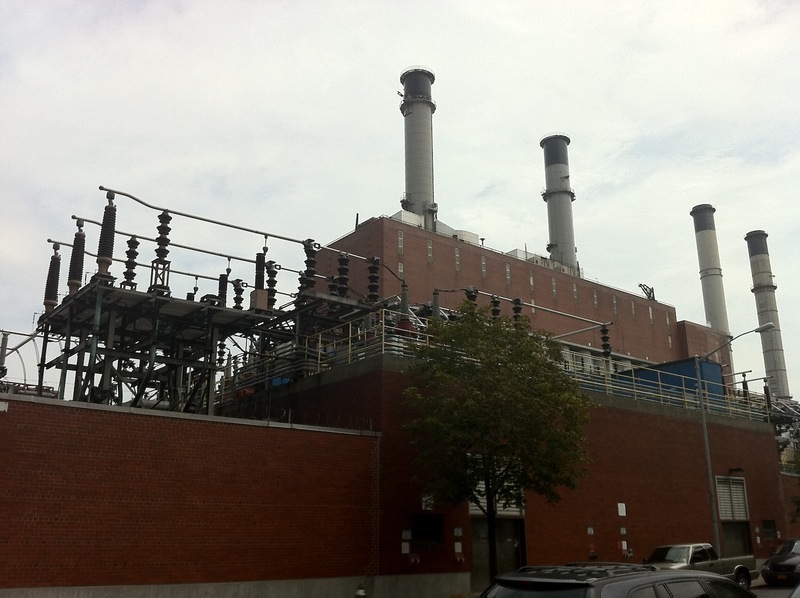 According to Forgotten New York: "421 was a Con Edison substation built in 1920-21 that converted direct current to alternating. It is at present (2008) the studio of modern artist/sculptor Walter De Maria." According to a 1919 Board of Appeals resolution, the “four-story fireproof transformer building” would accommodate a switchboard room, static air chambers, blower room and rotary foundations on the first floor; rotaries, transformer, and booster compensator on the second floor; a battery room on the third floor; and a high tension room and blower and exhaust chambers on the fourth floor. Three people would work on the first floor and two on the second. I've never met anyone who has been inside. I'm not sure if any photos exist of the interior. Kinda "Willy Wonka and the Chocolate Factory"-ish. This is your dream home! Where would you like to live? Maybe you'd want to live in the penthouse at the Christodora? Or maybe the entire building! 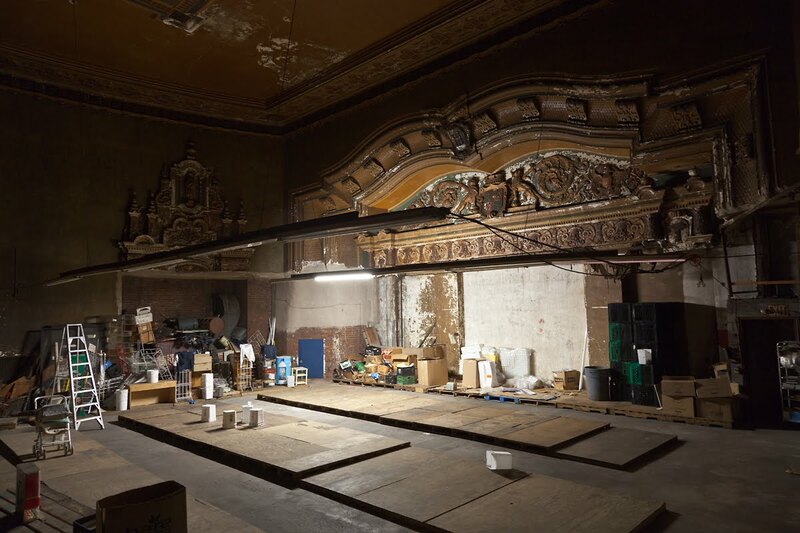 Or maybe fix up the dilapidated secret theater inside 100 Avenue A? I've always been a huge fan if the 4-story townhouse on Ave B btw 8/9th -- overlooking Tompkins Park. ... or Penthouse of the older Cooper Square Hotel -- some of the best views of the city I've ever seen. If there are no rules, then I'll take the Tompkins Square Library Branch. I love the windows on the upper floors — perfect for viewing TSP. 10th Street is my favorite block in the city. I'd probably choose one of the townhouses between Second and Third avenues. Although, as much as I love the East Village, I'd be even happier a few blocks west between Fifth and Sixth avenues on 10th Street. There are a couple great places on B bt 8/9. The town house, the one w the rafters, my GF and I always daydream about them as we walk by. Im going to go w @dens and pick one of those. I used to have a list, but on the spot I cant think of any of them. My general requirements are; penthouse, private roofdeck, on a quiet street, high ceilings. I liked Chloe's old place, but, come on, if we are playing this game, you have to go bigger, but a spot like that *2. 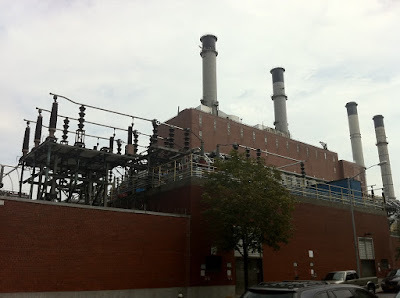 I believe that the Con Ed substation use to be owned by William Wegman. Maybe the Bowery Lane Theatre? There's also a simple cute little red building next to the Russian Orthodox Church on 2nd St, across from the Marble Cemetery that I've had my eye on for some time. Thank you so much for the info on 421 E 6th! Things like this have made reading EV Grieve so rewarding. I lived on that block for 10 years and always wondered what the story was with that building. Walter De Maria may use it as a work studio, but I don't think anyone lives there. It was pretty rare that I would see anyone go through the door, and, when I did, it was more of a worker type. I asked one person going in the door what the building was, and he told me it was for storage. I think the people that go in there usually enter from the 7th Street side, and I rarely see lights on in the building. I have noticed that someone delivers a Wall Street Journal to the E. 6th St. door! I have a photo of it somewhere. Was going to take a quick look at a paper once, but that felt really... creepy! Always wondered what that crazy-looking building was on 6th St. Cool. You once did a post on the cabin atop the Kiehl's building. Tempting if it wasn't so close to NYwoo. I'd like to live in a squat commune - a really big one, in an old building with great heat and good water pressure, where everyone has their own quarters, there's a huge area for parties, and everyone is of a similiar political persuasion (radically leftist liberal, of course). I have been in two of the penthouses in the Christodora House and they are pretty rad. I have also been in the private apartment at top of the Bath House on 11th Street and B (the rest of the place is a photo studio). Some dream spots are, the old synagogue turned town house on 7th St btw B&C. And there is what looks like an old garage space on 4th St between 1st and 2nd. It's clear an artist lives there as the mural on the front wall changes periodically. I also dream of fixing up PS 64 and returning it to an art space/ dream place to live. I'm obsessed. I've been obsessed for as long as I can remember. I used to fantasize about squatting it before it was refurbished. The upgrade is nice- But I sort of prefer the seedy, half-boarded up dilapidated version. The lovely, graceful old townhouse at 331 East 6th Street, now demolished to make way for David Schwimmer's ego - er, pool. This seems to fit your requirements. Ooo, I've often fantasized about what I could do with that Walter De Maria building. There are a couple of places on the north side of E 7th btw C&D I've always been curious about, too. Anything that backs up to a beautiful garden and comes with a top-floor studio with sunlight. I also fantasize about buying up my own crummy building and installing a closet and washer/drier. I have been intrigued by a lot of places mentioned here: 10th Street/Stuyvesant Street. Was always more interested in Charas (in the early 90s there was a rumored price tag of $500K on the building) than Christadora. There is a former bath house on east 11th street A/B that spent years as a beer distributor in the 80s and last i looked was some kind of car showcase. Ragtime was filmed there. There is a former bank on 7th and C that I have been curious about. We moved from EV down to LES last year to a comfortable 2 BR after 20 years in under 500 square feet, so I am living my dream. Thanks Hey19, great location but as far as I'm concerned they destroyed the place with their reno, and oh, that sh*tty karma. plus, the glass spotlighted blacony is obnoxious, and well, begging to be egged. Not one for the "Let them eat cake" style. I love that building on 6th Street. It looks like a cross between a mental institution and a mad scientist's secret lair. Maybe we can get Scouting New York in there somehow? Or hell, how about me? Walter? I left EV last year for Stye Town and given unlimited choice I don't know if I could improve my location. I have grown to love walking out of the building and being met with peace and quiet. No weirdos, no bums, no drunks, B&t's, Greenpeace volunteers, etc. There are many bros and Megan-types but in this quiet context they usually seem more civil and tolerable. Barely and vehicle traffic. The downside to all the quiet is neighbors being able to hear too much of each other. So if I choose any digs in the whole city I might just go for the entire top two floors of my current building. 10th st "Middle Village" is really nice but its still in the heart of NYU hell. lots of bedrooms and a huge entertainment space sounds like "let them eat cake" style to me. Not to mention good plumbing. @Roxanne Wolanczyk - the bath house at 538 East 11th Street has not been a "car showcase" - actually, it was an illegal garage and chop shop - for many, many years. It was purchased in the late 1990s by the late photographer Eddie Adams, and turned into his house/photo studio. His wife Alyssa and his son still live there and often have high fashion photo shoots or promotional events in it. @Anon 1PM The Concert Hall Loft is GORGEOUS! I would love to live in the abandoned theatre on Avenue A. I would renovate the building into a grand opera house and revitalize opera now that Amato Opera is no longer. I would live on top of the theatre like a phantom, only with better music. Oh, yes, that concert building on 5th St is fantastic! My understanding is that Walter DeMaria does reside at 421. I've seen him once. He is famous for disliking most people and being a misanthrope of sorts. Last summer ConEdison was doing some work outside his building and had to get into it for about a week. The door was open when I passed by one day, so I stepped in to what appeared to be an anteroom of an art gallery of sorts. I did a cat adoption home visit in a carriage housCamnd a building on 10th btwn A and B but my #1 choice would bethat weird two story building on the West side of Campos on 14th. I've been obsessed with it for years. Thank you for letting me know about the bathhouse. I lived next door to it the mid 80s (when a 16 year old with no credit history could get her own lease) and I remember it as a beer distributor, perhaps I am wrong and it was a chop shop. Later, in the 1990's, I distinctly remember seing some luxury automobile showcased and rotating in there, and it was like that for a while. Honestly have not observed anything about the building since then. Artist Izhar Patkin's school turned studio and epic living space on 1st st between 1st and 2nd. @Roxsnne - You are thinking of Zambrana, they were a food and beer wholesaler/distributor for all the supermarkets in the area. After they closed the chop shop moved in; the twirling car sounds like one of the upscale promo events the photo studio hosts on a regular basis. Love your story about getting a lease at 16 - those were the days!!! I would love to be a rich n' crazy cat lady wandering the vast and beautiful space of Immaculate Conception (14th/1st). But more realistically (and sorry, technically not EV), I'd like to live at the Abbey, aka the former St. George's Church on 16th between 3rd and Rutherford. My favorite is the beautiful building that houses ABC Sanctuary on 6th between B and C. The apartments overlooking the community garden are my dream home. How about that beach house atop the building on the NW corner of 1st & 1st? You can see it best kitty corner across 1st Ave. I heard once he built it because his friends all had places in the Hamptons but I don't know anything else. It always gives me a faraway & homey feel at the same time. There is a great penthouse on 3rd, east of B, north side of the st. Maybe not as nice as some of the places mentioned, but great roof deck, w a hot tub. I'm glad no one will be trying to steal my dream home on 2nd street that sits in the marble cemetery. It is not a big home but I would love to have that beautiful graveyard surrounding me as my neighbor. I read a long time ago, and just skimmed now, but maybe some more info, at least good pics and comments. I would take 100 Ave A, the secret theater. Plenty of room for a huge apartment AND a market back on the ground floor. 84 Second Avenue, so creepy, so amazing. A 1-bedroom for $800>/month or a studio for $500>/month.